“It was one of those expeditions where it all fit together perfectly,” says Hansjoerg Auer. 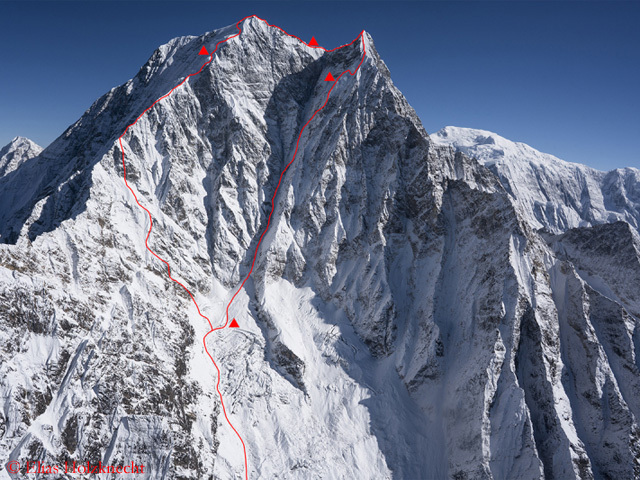 The 31-year-old Austrian and his countryman Alex Bluemel succeeded the first ascent of the North Face of the 7005-meter-high Gimmigela East, in Alpine style, means without ropes and high camps, without Sherpa support and without bottled oxygen. The sub-peak of Gimmigela Chuli (7350 m) is located in the far east of Nepal, on the border with India, quite hidden in the area around the eight-thousander Kangchenjunga, the third-highest mountain on earth. For sure, it was an amazing highlight of alpinism, but a shadow falls across. 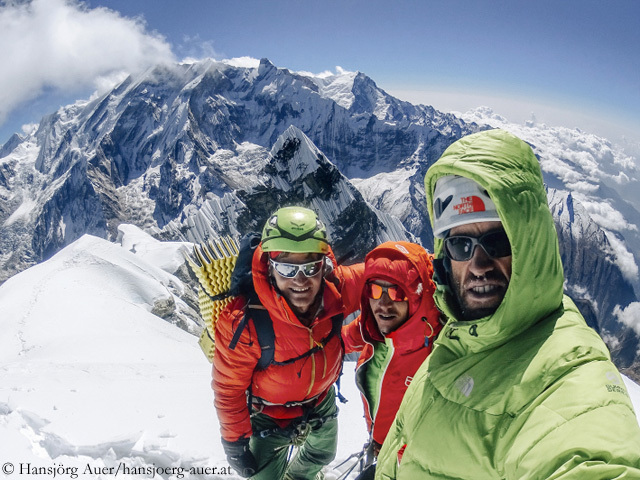 At the end of October – as reported – the Austrians Hansjoerg Auer, Alexander Bluemel and Gerhard Fiegl first climbed the South Face of the 6,839-meter-high Nilgiri South in the Annapurna massif in Nepal. Five previous expeditions, top climbers from Japan, Czech Republic and Slovakia, had failed to climb the wall. However, the success of the Austrian trio turned into a tragedy: While descending, Gerry, manifestly suffering from high altitude sickness, fell to his death several hundred meters deep, three days after his 27th birthday – while his friends were looking on in horror. A few days later, the search for Fiegl was abandoned. Hansjoerg Auer sustained frostbite on six toes. Meanwhile the feeling in his toes has returned and he can climb again, the 31-year-old tells me. Next spring, he wants to set off along with his compatriot David Lama to a “cool, very difficult destination”. He doesn’t yet reveal, where it will be. I’ve talked to Hansjoerg about what happened in late October. 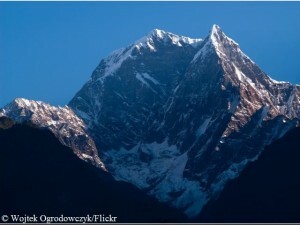 Hansjörg, you succeeded in making the amazing first ascent of the South Face of Nilgiri South. But on the descent your teammate Gerry Fiegl fell to his death. Does this tragic end make everything else fade into the backround? Anyone who has ever climbed a very high mountain knows about the dangers during the descent. Not the dangers of the mountain itself, but of your own body. Suddenly all adrenaline is used up, you feel the pain that you have pushed away during the ascent, you are exhausted, only want to get down quickly and run into danger of losing your concentration. It’s not for nothing that many accidents happen on descent – like on the 6,839-meter-high Nilgiri South in Nepal, where the Austrian Gerhard Fiegl fell several hundred meters into depth on Monday of last week and has been missing since then. As reported, the search for the 27-year-old was meanwhile abandoned. According to the other two team members, Hansjoerg Auer and Alexander Bluemel, the trio earlier had “successfully reached the summit after climbing through the more than 1,500 meter high South Face”. It was the first climb via the difficult wall where several other expeditions had failed in the past few decades. 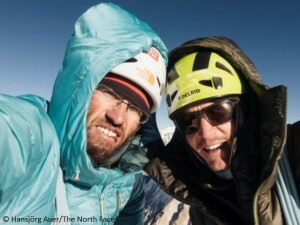 At the summit they noticed that their friend Gerry was “very exhausted”, Hansjoerg and Alex say. Was it symptoms of High Altitude Sickness? 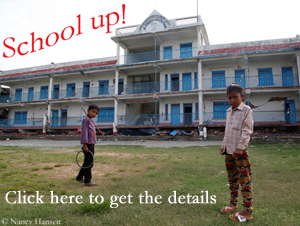 Fiegl’s rapid drop in performance might indicate this. At that altitude, oxygen is pressed into the longs with around 40 percent less pressure than at sea level. That’s the way we humans do: No matter how short the straws are, we clutch at them. There is a small glitter of hope that Gerhard Fiegl is still alive. Since Monday, the Austrian climber has been missing at the 6839-meter-high Nilgiri South in the Annapurna massif in Nepal. Three days after his 27th birthday, the mountain guide from the Oetztal – as reported – fell several hundred meters deep while his two team mates were looking on in horror. Hansjoerg Auer and Alexander Bluemel descended to Base Camp and immediately called for a rescue operation. But snowfall and fog prevented helicopter flights. The search for Fiegl is to be continued. Even if the probability to find him alive is low and decreases as each day passes, we should not give up. Even on the highest mountains, now and again there are stories of survival that are almost miracles. 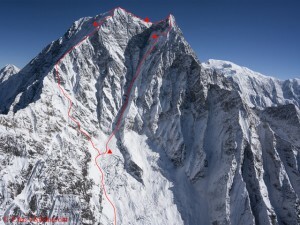 Sad news from the Austrian expedition to the South Face of the 6839-meter-high Nilgiri South in the Annapurna massif in Nepal: A spokesman of the Austrian Foreign Office confirmed to me that one of the three climbers who had started their first summit attempt last Thursday was missing. According to him, the climber slipped during the descent and fell about 800 meters deep while his two team mates were looking on in horror. The two climbers descended to Base Camp. 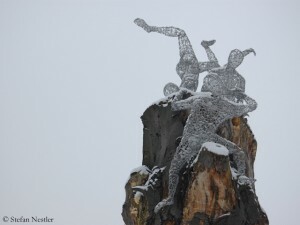 Fog and snowfall hampered the helicopter rescue operation. The search was going on, the spokesman said. He gave no details about the climber who fell into the depth adding that they were in touch with his relatives. The push is on. The Austrian Team that tries to first climb the South Face of the 6839-meter-high Nilgiri South in the Annapurna massif in Nepal has set off for their first summit attempt. I was told this by a speaker of Hansjoerg Auer in Austria. On Wednesday Hansjoerg had tweeted that their acclimatization was coming to an end and that their first attempt was about to start. Auer is climbing along with his compatriots Alexander Bluemel and Gerhard Fiegl.